See each of the commit messages for more detail on the changes. Allows the use of containerd as an experimental runtime for containers on Windows (WCOW being both process and Hyper-V isolation, as well as LCOW). functionality needed for docker. gMSA and cloning/templating are two obvious omissions. The gaps will be resolved in time - this PR is a stepping stone in migrating Docker on Windows to containerd for those wishing to experiment, not a full switch-over. You will need the following binary from github.com/containerd/containerd in your path. You will need to make sure this is from master currently, not a 1.2.x branch. This is no different to the current requirements. Linuxkit (https://github.com/linuxkit/lcow) is currently far behind https://github.com/Microsoft/opengcs master, so you may need to build your own initrd.img, as well as kernel. A 4.19 based kernel is preferred. @ddebroy @andrey-ko Waaaaaaay too early and much is in flux. Merging #38541 into master will increase coverage by 0.54%. The diff coverage is 26.54%. @andrewhsu Cool. I value any help. It's a huge job to undertake. But please bear in mind, I can't accept anything that doesn't take Invoke-DockerCI into the equation - that's used internally on nightly Windows builds, and can't be broken. As well as by Windows devs in general. I would suggest that an alternate starting point, while not directly related, would be looking into how to get integration (not integration-cli) running on Windows CI. Some groundwork has been done between myself and @vdemeester carrying what I started. Both in hack\windows.ps1 and Invoke-DockerCI. We really need that coverage as integration-cli is locked for additions. That allows us an in-road into getting LCOW and xenon coverage, all of which are desperately needed in containerd-land. I’m not even sure buildkit works on Windows (never tried). It will need more than these warnings as it would need to mirror what this PR does and move to a command line. @thaJeztah. Yes I can do those follow ups. Might need a little more work as we don’t use runhcs in the unified shim model in containerd, but I’ll figure something out. The runhcs.exe is required, I otherwise got this I couldn't run or kill containers. C:\Program Files\Docker\docker.exe: Error response from daemon: exec: "runhcs.exe": executable file not found in %!P(MISSING)ATH%! (NOVERB): unknown. @StefanScherer doesn't repro here. Are you POSITIVE you are using the right shim binary? @jhowardmsft I tried a Dockerfile using double quotes. Single line RUN instructions seem to work 🎉 💯. What a relief. Sure I can keep single quotes here, but wanted to try out where people might use it. Is that a regression (the multi-line)? 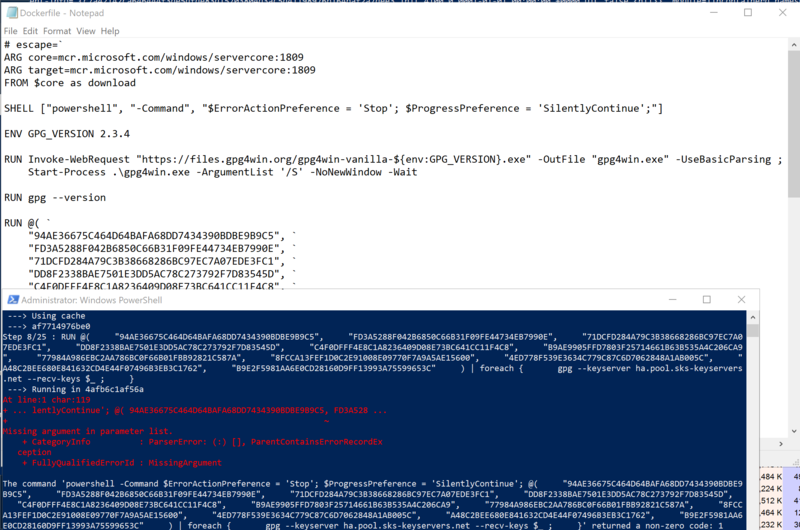 RUN powershell -Command Write-Output "The version is $env:VERSION"
RUN Write-Output "The version is $env:VERSION"
PS C:\node\quoteetst> docker build --no-cache -t test . Step 3/5 : RUN powershell -Command Write-Output "The version is $env:VERSION"
Step 5/5 : RUN Write-Output "The version is $env:VERSION"
The output is multi-line so there were no quotes in the Write-Output command. My download from the previous Dockerfile fortunately worked without the quotes. ERRO Error waiting for container: container a2d618fa593f2f4992590a92ac49e2317497b088ba4fb6a383cee40491de1cb7: driver "windowsfilter" failed to remove root filesystem: failed to detach VHD: invalid argument: rename C:\ProgramData\Docker\windowsfilter\a2d618fa593f2f4992590a92ac49e2317497b088ba4fb6a383cee40491de1cb7 C:\ProgramData\Docker\windowsfilter\a2d618fa593f2f4992590a92ac49e2317497b088ba4fb6a383cee40491de1cb7-removing: Access is denied. @StefanScherer I’m still trying to understand if this is a regression or not. Can you be more precise? @jhowardmsft I think I remembered something wrong. I kept in my mind that I sometime should test this PR to check an enhancement how we can use quotes in RUN instructions. As I finally had some time today to set everything up I tried it out in the hope that we can use double quotes, but it seems I remembered this wrong. So no regression, it just doesn't work as it would be nice to work. So forget about this false alarm. We should track this in another issue. All other things with containerd work for me on a Server 2019, even docker run --rm. I’m going to merge this so we can move forward given there are three LGTMs and a slack-LGTM from Derek. @thaJeztah YOLO.